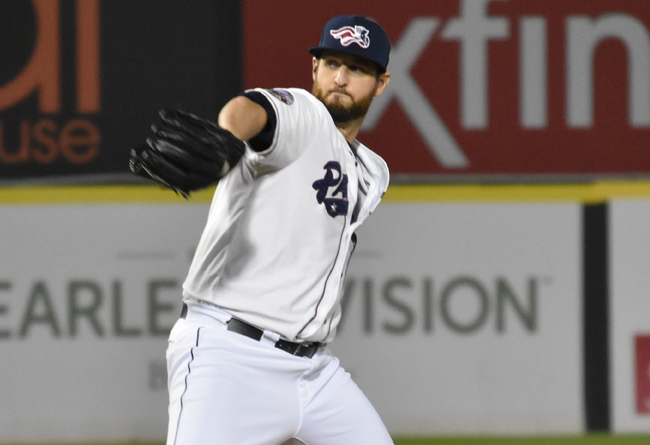 (Bridgewater, NJ, Jan. 10, 2018) - The Somerset Patriots have announced that 2017 left-handed relief pitcher Keith Hessler has signed with the Colorado Rockies organization. He recently wrapped up his first season with the Patriots. The former major leaguer made 13 appearances with Somerset last season, striking out 13 batters over 13.1 innings pitched. He also made two relief appearances in the postseason over which he tossed two shutout innings with three strikeouts. The Silver Spring, Maryland native made his Major League debut with the Arizona Diamondbacks on August 8, 2015. He appeared in 18 games with the Diamondbacks that year, striking out 12 batters over 12.1 innings. Hessler has split time between the Triple-A and MLB level since 2015 with the Diamondbacks and San Diego Padres. Arguably the most impressive season of his professional career came with San Diego in 2016, in which he made 15 relief appearances at the big league level with a 3.38 ERA and nine strikeouts over 18.2 innings. The southpaw began his 2017 campaign with the Triple-A El Paso Chihuahuas in the Padres organization. The left-hander struck out 36 batters in 45.1 innings over 41 appearances with the team. Hessler was originally drafted by the Diamondbacks in the 28th round of the 2010 MLB June Amateur Draft out of Coastal Carolina University. The Padres claimed Hessler off of waivers from Arizona in May of 2016. Over the course of his seven-year professional career, Hessler has appeared in 323 games (35 starts), with 27 wins and seven saves. Hessler becomes the 15th player from Somerset’s 2017 roster to be added to a Major League organization. He joins left-handed pitchers Jeremy Bleich, Logan Darnell (twice) and Aaron Laffey, along with right-handed pitchers Tyler Cloyd, Ryan Kelly, Vin Mazzaro, Mitch Atkins and Dustin Antolin as pitchers to either have their contracts purchased or sign with an MLB club. Infielders Tyler Bortnick and Joe Maloney – alongside outfielders Jerry Sands, Christian Marrero and Justin Pacchioli – also joined Major League organizations during or after the 2017 season. The Atlantic League has been a leader in professional baseball and a gateway to Major League Baseball since 1998. Over 38 million fans have attended Atlantic League games and more than 900 players and 50 managers and coaches have joined MLB organizations directly from the ALPB. The Atlantic League emphasizes winning baseball games, showcasing the talent of top-caliber players and offering affordable family entertainment to metropolitan markets serving nearly 15% of the US population.